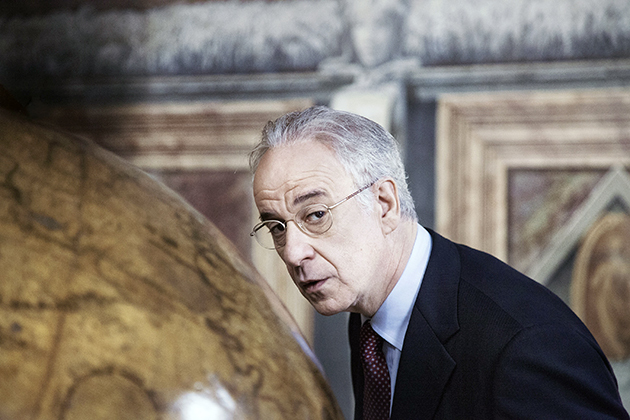 In this elegant and chilling story about world politics, the great Toni Servillo defies expectations playing two roles, imbuing each character with brilliant nuance and astonishing attention to detail. In the first, he personifies political failure in the role of the disgraced ideologue and party leader, Enrico Oliveri. In the second, he embodies the shrewd genius of a madman as Oliveri's unhinged twin brother who seizes control of the nation amidst the void of his brother's disappearance. As the national election approaches, Enrico Oliveri has plummeted in the polls and his supporters and adversaries alike begin to acknowledge his impending downfall. Unwilling to face the failure of his party and his nation, Oliveri vanishes into the night. The party leadership tries to hedge for time by concealing Oliveri's disappearance with a series of acrobatic sidesteps. In a desperate move, right hand man Andrea Bottini seeks out Oliveri's look-alike twin brother, Giovanni Ernani, a prolific author and philosopher who is freshly released from an insane asylum. Slowly and steadily, Giovanni insinuates himself into his brother's public persona, impersonating Oliveri's every tick and mannerism exquisitely—yet slightly imperfectly. Giovanni quickly surpasses his brother's political prowess with an eerie talent for rallying the masses through fearless and heroic speeches. As Ando shifts between the failure of the sincere intellectual and the heroics of a madman, he probes the driving forces behind our contemporary global political reality leaving behind a rich web of questions in this unpredictable and provocative thriller.